We are not sure what is on the bottom of the pool. We had a lot of thunder storms and are not draining the pool so that we can move it next year. At first we thought that it was just plain algae on the very bottom and side of the pool (about 6 inches from the bottom). Then we realized that it is not just algae. It is dark green and it is VERY hard. I have sprayed and tried to remove it with a hard Brussels brush. What can we do to get rid of it and not ruin the pool liner? It seems to be weakening the liner. Do you have any ideas on what we may be able to put on it to make it easier to remover or something else? Again it is very hard, the parts that I did scrum off seem to be hard like calcium build up but its green. Hi Amanda. You mentioned you are not draining the pool to move it. I assume you meant you are draining the pool to move it, and, if so, it's a good time to replace the liner. Your existing liner will shrink as soon as you drain it. It is never worth the frustration to install a used liner. Buy a new liner and start clean. In the future you know what to watch for and you can jump on it early. You may need to brush the sides more or use a rag on them on a regular basis. Starting with a clean liner and keeping it clean would be much easier than cleaning up your existing liner. 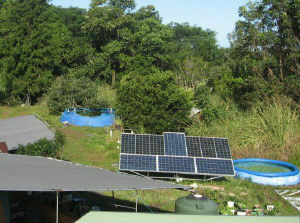 I have a water catchment tank which I use the water for irrigating an organic garden. Should I be concerned about potentially toxic chemicals leaching from the liner of anything but a food grade liner (e.g. Doughboy)? Hi Michael. I have never heard of a food grade liner, but that does not mean they do not exist. Over my many years of installing I put up several pools for the purpose of raising fish and never had a problem. We also did a couple for catchment purposes. My best friend lives in Hawaii, as you do, and above ground pools are very common for catching the rain water and using it for everything except drinking. He lives out of town and goes in once a week to buy a few groceries and re-fill their bottles of drinking water. Most everything he eats is from his garden and from his fruit trees. They use their above ground pool water to water everything and even to bath in. He has never mentioned to me that one particular liner might be better than another. I would be very confident to suggest that by the time the pool is full of water any harmful chemicals used in the liner manufacturing would be so diluted as to not being a problem. 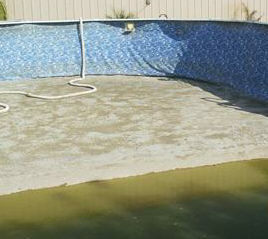 Kids swim in these pools right after they are installed without a problem, and we know how much water they can drink. Is there any stretch in a 15' by 42" above ground round frame quick set liner? I have been reading all of your post that have been e-mailed to me and they seem to say make sure it is warm and sunny. Thanks, your web site has been very helpful. Hi Frank. 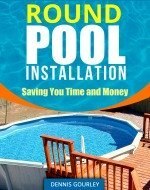 Warm and sunny can be helpful with any kind of vinyl lined pools. It's very important when it comes to installing vinyl liners into steel walled above ground pools. That is mostly what I write about. The liner on a quick set pool also becomes more pliable with direct sunlight. Whether or not that would allow it to stretch I'm not sure. It does make it easier to work with and much easier to smooth the bottom out. The leak has been fixed but now I can't get all the water out from behind the liner in our inground vinyl pool. So when I fill it back up there is a ring in the deep end? Hi. I can think of a few different solutions. It might be possible to pry the bead of the liner out of the receiver in one small area. The water could then be forced out the hole and the bead put back into place. If I understand you correctly the water is in the deep area of the pool so it might be difficult to work it all the way to the top. But worth a try anyway. It is also possible to put a small slit in the liner, force the water out, and then patch the hole. Correctly patching a liner actually reinforces it instead of weakening it, so I would not hesitate at all doing this. When doing a repair like this it is best to use Boxer glue and a piece of actual pool liner as opposed to the clear vinyl that comes with the patch kit. You could wait until the water evaporates on it's own, and it will eventually. The only downside to this is it may permanently stretch out the liner. If the bulge is big enough, and it does stretch the liner, you may be left with a baggy liner. This could possibly pose problems with cleaning the pool.